When we see a job has been well done, it’s natural to offer feedback to the person responsible. But a simple expression of appreciation has limited value on its own. Feedback is often given and received with thanks, and while it will brighten someone’s day, it is won’t have really significant benefit beyond that. Feedback can be used by leaders to let people know what’s being done and who is doing it well. Leaders can use feedback to champion their team and demonstrate its value to people at all levels of the organisation. For feedback to have this kind of impact, it needs to be known about and talked about. This happens when it is deliberately, purposefully talked about across teams and organisations. 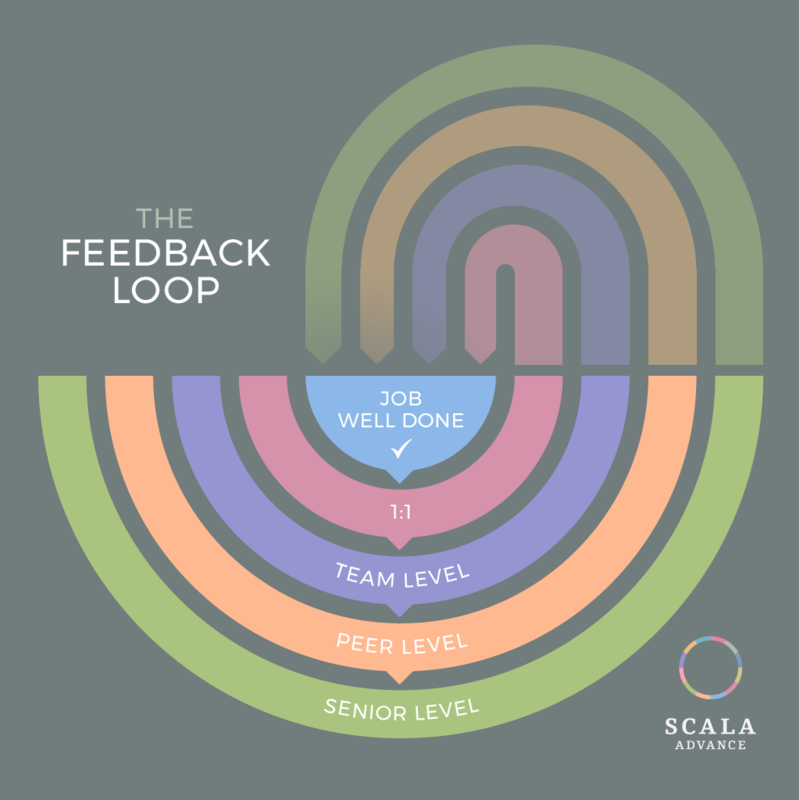 Feedback forms a loop around the organisation, with everyone, on every level, hearing it. A job is well done, and this is noticed. The job might be a one-off exceptional effort, or simply consistent good work over time. Feedback is given to the person who did the job, by their direct leader in a 1:1. The leader lets team members know about the job well done, shining a spotlight on their exceptional effort or consistent work. The leader makes sure that their colleagues at peer level know. The leader tells senior managers. They may remember the feedback and use it to help them make decisions. They may personally congratulate the person or team behind the work. Both the giver and receiver of the feedback get a boost. Feedback comes back to the 1:1 via senior managers, peers and leader. The person who did the job well knows that their leader has taken the time to let everyone know, inspiring them to do well again. Feedback can translate individual and team performance into impact. Leaders can use it to promote their team without overindulging in self promotion (which everyone sees through). The feedback loop isn’t quick, and should be used with judgement, when something has been done that really warrants it. There’s nothing wrong with offering quick, off-the-cuff feedback, but sometimes, a more thoughtful, purpose-driven approach is needed.